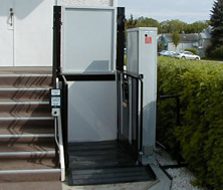 A vertical platform or porch lift provides practical solution for making your home or business accessible for a wheelchair user. Quite often, people are forced to decide between installing a wheelchair lift or a ramp, to create safe and easy access, but ramps aren’t necessarily any cheaper. They take up so much more room and require a lot more installation time. 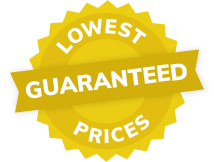 Wheelchair lifts are a more affordable solution. 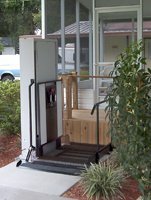 If you have difficulty using stairs, or use a wheelchair or mobility scooter, then installing a Wheelchair Lift is a great way to ensure safety and convenience every time you enter and exit your home. Vertical platform lifts can be ordered in different configurations to accommodate new or existing buildings with little or no modification. Whether it’s for residential or commercial use, we offer a selection of easy to install wheelchair lifts for indoor or outdoor use, even in harsh weather conditions. 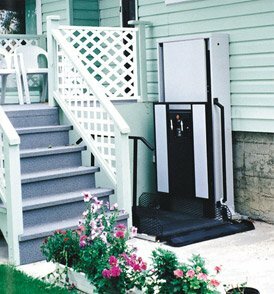 A Freedom Residential Platform Lift is an affordable way to provide safe and easy access to your home for people who use a wheelchair, scooter or walker to get around. Easy to install and easy to operate the Freedom Lift Systems are a popular choice for thousands of North Americans. 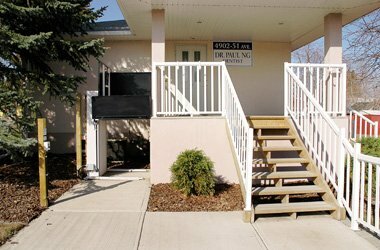 Whether you need access to a small porch, or need a high tower lift to reach the back deck, we have different lifting heights and configurations to suit your needs. 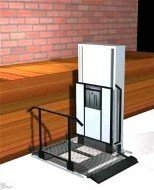 How much does a Wheelchair Lift Cost? Quite often a lift is more affordable than installing a wheelchair ramp, and will take up significantly less space. Preparing the site and the installation time and labor are also factors to considering when planning your budget. Some states or municipalities will have certain requirements regarding installing a lift, so check with the local building permit office before ordering. 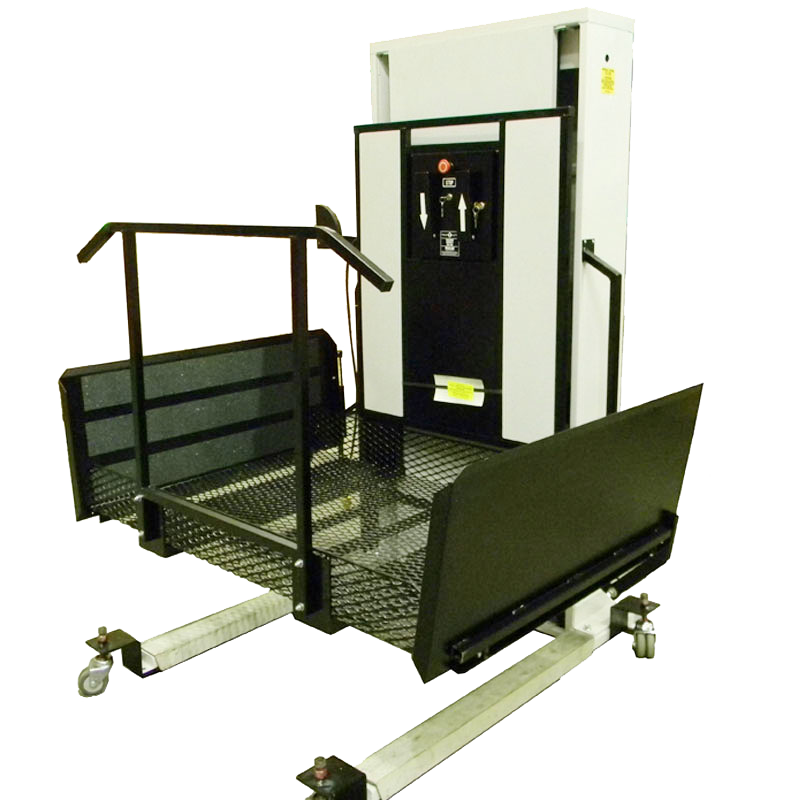 For maximum lifting heights up to 60” we offer a range of Freedom Commercial Wheelchair lifts to make businesses and public spaces accessible to all. 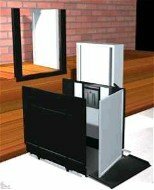 We know that meeting certain code requirements can make having a wheelchair lift installed complicated. With over 9 different national codes and individual state or municipal codes to comply with, we know the importance of getting it right the first to avoid costly changes. We can have a commercial wheelchair lift configured the way you need it, but it’s also important to check who can install the lifts. In most of the country a vertical lift must be installed by a licensed elevator installer, however is some areas a license in not required. Send us this information and we can provide you with a quotation and drawings for the building inspector. 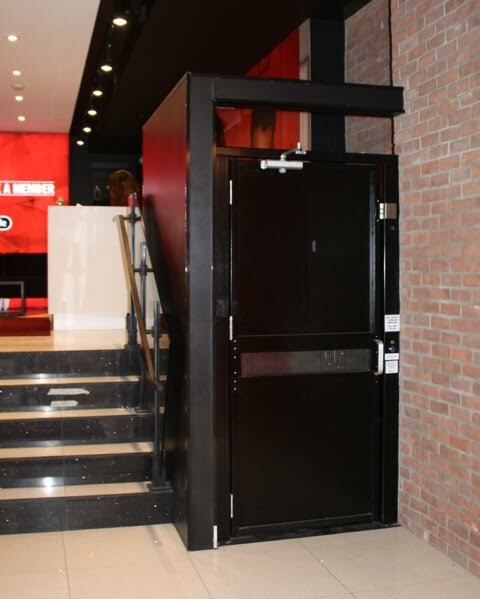 Some public buildings need to provide wheelchair accessibility to different levels or areas, but won’t be able to install a permanent wheelchair lift, either because it’s not needed all the time, or because there isn’t an ideal place for the installation of a lift. That’s where Freedom Portable Wheelchair Lifts work well. We get a lot of requests from schools, churches or community centers that need to provide a way for students, parishioners, or other attendees who might not be able to use stairs, to be able to get onto a stage for special events. 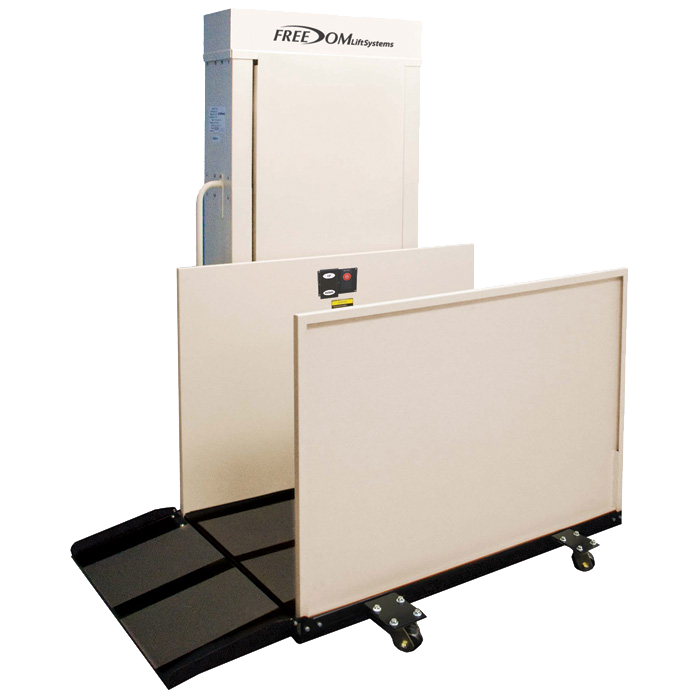 The Portable wheelchair lifts provide vertical access to platforms that are a maximum lifting height of 53” or less. When not in use the lifts can be rolled into nearby storage. As always, check with local code requirements to make sure a temporary wheelchair lift is compliant before ordering.